"Sometimes we let our thoughts of tomorrow take up too much of today. Daydreaming of the past and longing for the future may provide comfort but will not take the place of living in the present. This is the day of our opportunity, and we must grasp it. 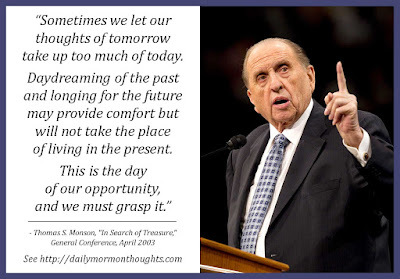 "There is no tomorrow to remember if we don't do something today, and to live most fully today, we must do that which is of greatest importance. Let us not procrastinate those things which matter most." How can we live as happily and contented in each day as possible? 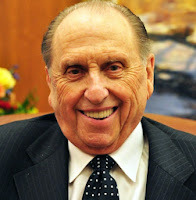 President Monson suggests that one critical aspect of that challenge is to avoid dwelling too much on the past or anticipating the future. It's critical to learn to "live in the present"! And so President Monson reminds us that learning to "do that which is of greatest importance" in each day, and to not "procrastinate those things which matter most" as we live our lives, is a crucial task of life.